WOW! 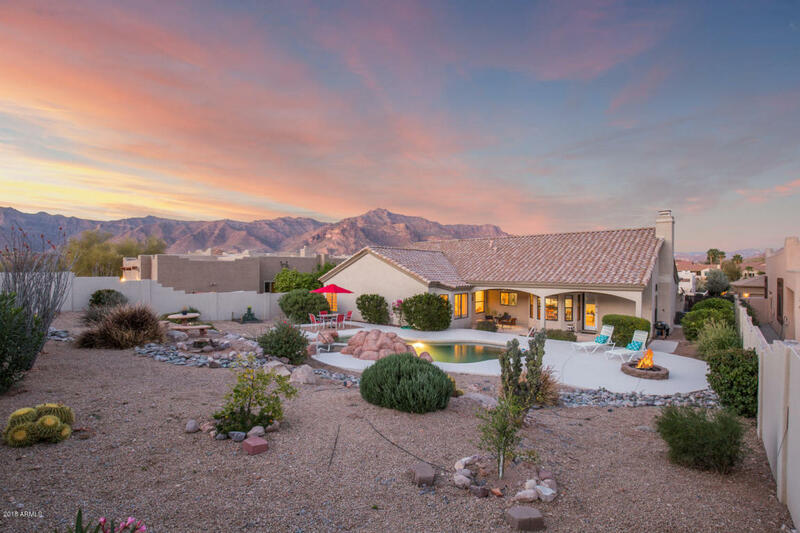 4BR, 2.5 BATH CUSTOM HOME with 3cGAR in very desirable neighborhood surrounded by MOUNTAIN VIEWS! You'll love the... GENEROUS PATIO SPACE with multiple seating areas, ***HEATED POOL & SPA with WATERFALL, ***NEWER HVAC system, water heater, disposal, pool filter & vacuum! *** Gourmet kitchen has newer french door STAINLESS REFRIGERATOR, custom cabinets with 3'' crown molding, custom range hood, GORGEOUS GRANITE & large utility/storage room, GREAT ROOM with gas FIREPLACE & MASTER SUITE with DEEP SOAKING TUB + LARGE SEPARATE SHOWER w/private pool access! GORGEOUS PLANTATION SHUTTERS, plant shelves, CENTRAL VAC, dimmers, raised panel doors! Fantastic pacious FLEXIBLE FLOOR PLAN with so many extras plus GREAT CURB APPEAL with BEAUTIFUL LANDSCAPING. DON'T WAIT!